It’s not easy to farm in harmony with nature. In fact, it seems that whenever you think you have it figured out, nature demonstrates that she can make your plan fail, no problem at all. Yesterday, Patrick set off to the fields on his daily round of chores, and came upon a gruesome scene. In one of the chicken enclosures, 40 of the 5-week-old chicks had been killed by a predator. 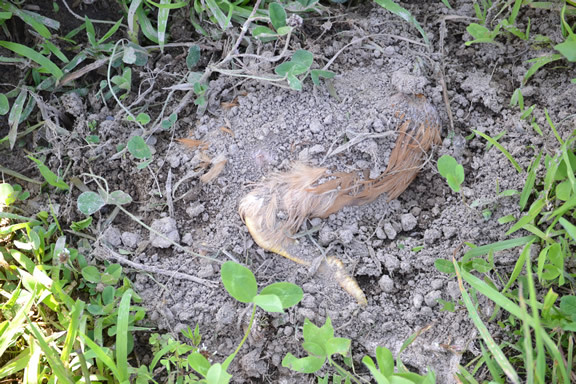 We aren’t sure what the animal was, but it got to the chicks by digging a shallow ditch under the electric netting. Lately, grass and weeds have grown thick around the electric fences all over the farm, draining power from the fence at every point of contact. The voltage got low enough that the predator, whatever it was, was undeterred by the shock. We all feel sickened by this episode. Steve has been furiously taking it out on the weeds with the weed whacker. He also installed a bigger fence charger, so the voltage is now back to a level that should be effective. As for the animal’s identity, we were quick to suspect a fox. A fox has been spotted many times snooping around the fence. But the mass killing is not typical of foxes. And here is a strange detail: several of the dead chickens had been buried. Domestic dog is one possibility. Fisher cat, badger, and skunk are all on the list. But none of them matches the m.o. perfectly. Craig and Patrick will be on the case this weekend while Steve and I are both away for the holiday. Craig is going to install a game camera for hunters to see if we can get a photo of the culprit, so we can figure out how to deal with it. It’s not that we think we can beat nature with technology–that is an arms race that we don’t want to start. But we have to solve this particular mystery because now that the predator has succeeded, it is almost certain to come back, bolder than ever. We’ll let you know how this turns out. Just about all predators will engage in surplus killing under certain circumstances that we don’t understand. Burial of surplus kill would suggest either a skunk or a fox to me. While a domestic dog will certainly kill lots of chickens, it wouldn’t be bothered with burying any for later because they are seldom killing for food. The value of the chicken as a resource is pretty much gone once it is dead and not running away. Whatever it is, you can be sure it will be back. The trail camera might help you figure out what it is.